Want Natural-Looking Light? Use Gels. You need great light to direct attention to your subjects and help your photos appear natural. If you want to make great light with flashes, you need gels. Gels simply color your flash’s light which allows you to match the flash color to the light in a room. When the light from the flash doesn’t match the ambient light, it stands out and looks like it was flashed. You’ll make more natural-looking photos if you use gels. I recently made a photo for a pro bono ad in a local magazine. 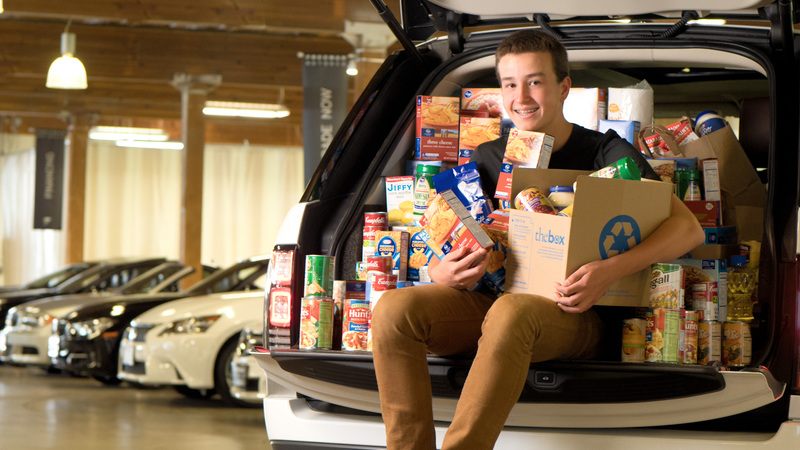 This fellow has started a food bank in town, and the local luxury car dealer was hosting a big food drive, so we were shooting the ad in the dealer’s showroom. The showroom has big lights and windows and is comfortably lit, but the light only shines from overhead and doesn’t work under the hatch of a car. I used a speedlight in a softbox to add soft directional light on my subject. But as you can see, that speedlight was too white compared to the ambient light. The overhead light didn’t light my subject when he sat under the hatch. The speedlight on it’s own is too white compared to the background light. I looked at the overhead lights and could see that they looked a little warmer than daylight balanced bulbs. I took a guess and added 1/2 CTO to my speedlight. CTO stands for Color Temperature Orange, and a 1/1 CTO makes your speedlight the same color as an incandescent light bulb. A 1/2 makes it a little warmer. I favor the MagMod system for adding gels because it is so easy and fast to use. Now the light was warmed to match the background. I used an X-Rite Colorchecker Passport to perfect the white balance. My guess of 1/2 CTO looked like a good match for the overhead lights. With the gel on the speedlight, the background light now matches the flash and it looks much more natural. When two lights are different colors, it can be distracting. Our job as photographers is to direct attention to our subjects and keep the technical details quiet and using gels with your speedlights will help you accomplish that.